Coast Guard Officer Pleads Not Guilty To Gun, Drug Counts In Alleged Terror Plot The charges against Christopher Hasson focus on his stockpiling of weapons and possession of drugs. Authorities say he holds extremist views and he planned violence. 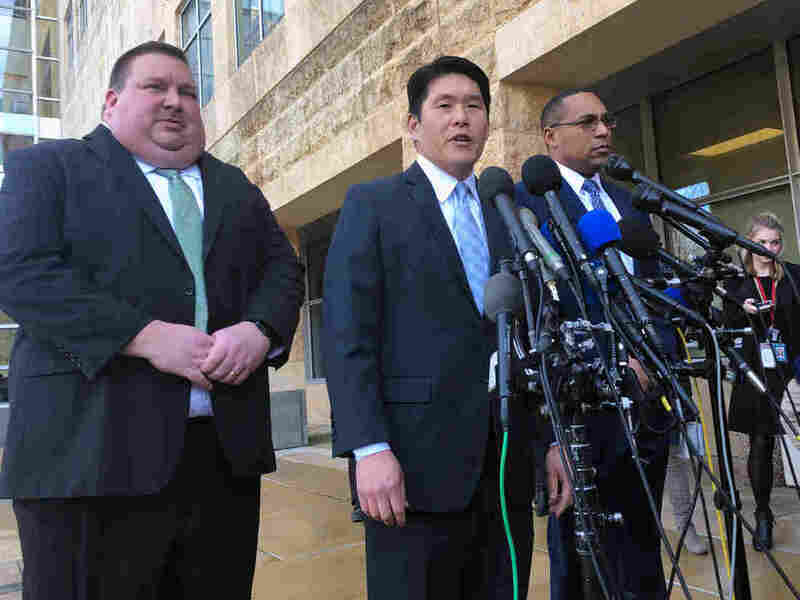 U.S. Attorney Robert Hur (center) discusses the charges against Christopher Hasson with Art Walker (left) of the Coast Guard investigative service, and FBI special agent Gordon Johnson last month. According to court documents filed by the government, Hasson was a self-described white nationalist who hoped to establish a "white homeland" through violent means. He also allegedly drew up a computer-speadsheet hit list with the names of House Speaker Nancy Pelosi, Senate Democratic Leader Chuck Schumer, and other high-ranking Democrats, as well as MSNBC hosts Chris Hayes and Joe Scarborough, and CNN's Don Lemon, Chris Cuomo and Van Jones. Hasson was not charged with terrorism. His original public defender said federal prosecutors were exaggerating his potential ties to terrorism. He faces up to 31 years in prison if convicted on all of the charges against him.